Beck has always been an advocate for the use of strong, clever visual solutions for his music releases, apparently growing up, he used to pick up albums based on their cover art as well 🙂 His latest release ‘The Information’ takes it up another notch. This clever little package design contains a set of stickers that allows you to customise your own cover. Art directed by uber album design specialists Big Active, over 20 image-makers were involved in the creation of the sticker sets. It’s a fun idea to ‘value add’ the physical CD in this day and age of easily down-loadable music – the listener becomes an active participant in the album experience. So the CD package is cool, but while I was in London I managed to pick up the 7-inch vinyl single of ‘Cell Phone’s Dead’ (the revival of the vinyl single in Europe is another story) that also contains it’s own set of stickers, along with a larger cover ‘canvas’ to display them on. I imagine out there somewhere you can also purchase a 12-inch full vinyl album. So while this is all pretty clever, I imagine it’s the sort of thing that will only effectively work once, it opens up a lot of ideas and possibilities for value adding CD packages in the future though. One of the first things I thought of when I got the Beck CD was that it was a pity that the stickers, once stuck down, are so permanent, wouldn’t it be cool if they were like those old ‘colour-form’ kits from my childhood (I had GI-Joe and Evel Knievel sets! )that let you take off and re-place the stickers over and over. How about a set of rub-down ‘letraset’ images or a cover that works like a magna-doodle set? It’s highly likely that the future of physical CDs lies in different areas of thought like this. There’s a contest online for the best ‘Information’ covers put together by listeners here, oh, and the actual music on the album is pretty good too! Go out to your record shop and buy a copy. So I went for a trip overseas a little while back (which I may have mentioned once or twice on here:) Anyway, I figured while I was over where ever I found myself, why not see if I could drop in and see a few designers whose work I admired? Easier said than done of course, many were asked, a few replied and some even said I could come and see them. London was particularly tough (maybe I shouldn’t have said I was Australian?) A few replied and very politely said they would be too busy or not in the studio when I would be there. Luckily one of the studios that I did really want to visit said yes, that being Value & Service. Value & Sevice was established by Directors Sean Murphy and Hazel Rattigan in late 2002. I know the term ‘thinking outside the box’ gets thrown around a lot, especially in design circles, but I had been really impressed by just how different the studios work was to just about everything else out there. They really take a considered approach to the use of materials and unique solutions to their projects in a real world setting, not just a design for design sake environment. I wasn’t really sure what to expect when I visited their studio is Shoreditch, what I found was a very down to earth group of designers pushing the boundaries of their profession but still dealing with the day to day challenges of running a professional studio. I spoke to director Sean Murphy. Chris Bowden: What first inspired you to get into Graphic Design? Sean Murphy: Believe it or not, there’s a program you might have heard of, a soap opera called Eastenders, there was a character in it called Colin who was a graphic designer and I quite liked the sound of the job, the term ‘graphic designer’ sounded quite interesting, I always wanted to be a TV camera man before I wanted to be a designer, so I wanted to be a graphic designer before I really knew what it was. I was always quite good at art and liked drawing. Rather than doing A-Levels which is what most people in the UK do, I went straight into a Btec in graphic design. CB: From there you went onto further study at a University? SM:I went from there to Central St Martins and that’s where I met Hazel, we worked together quite a bit at university, I left and Hazel went on to do an MA, I started working at North which is where I met our neighbours upstairs in Bibliotheque. I then went back to university to do my own MA as well, and about three and a half years ago, Hazel and I set up Value & Service. CB: Your folio contains quite a bit of work for artists, galleries and arts organisations, was this a conscious effort on your part to work in that area? SM: It’s not something we planned really and it’s probably something we’re trying to change a little bit, we’ve got that so well covered now, and it’s not an area that generally pays very well! So we want to change what we’re doing in some ways, we still enjoy that kind of work, of course, it depends and what you’re doing at any given time. We’ve just finished a book for an artist named Trevor Appleson, and in fact, we’re just about to start another one for him. CB: Do you think that sort of work offers you a lot of freedom or do you feel restricted by working under the particular aesthetics of the artist? SM: In some ways it’s actually more restrictive than more ‘corporate’ work in a weird sort of way. It depends who the client is though, we’ve worked with a curator called Tom Morton quite a bit, and he’s really good, he understands what we do and allows us to get on with it, he values it, he’s not one to stick his oar in in a sense. It’s a two way thing, the work always comes out of our conversation with him, rather than him dictating or us dictating. That’s a nice working relationship, when we first set up Value & Service, he got us to do some work on a one day art show he curated and he then went onto setup a one year temporary gallery and we were involved with that. 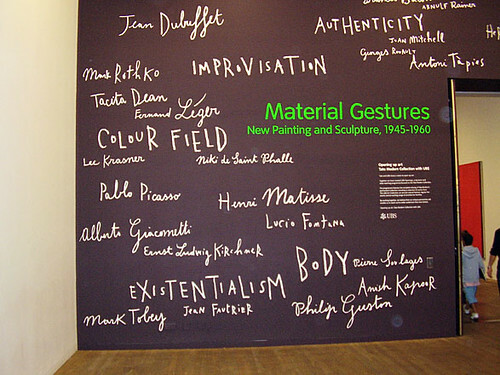 He then went onto be the curator at a gallery called ‘Cubitt’ and he’s brought us along with him. We’ve been quite lucky in who we’ve worked with, because they’ve all been quite open to our input, they’ve not had that idea that they tell you what to do and you just do it. CB: I guess the good thing about working in London is the amount of fine art related enterprises there are. SM: There’s a multitude of galleries and artists, there’s always something going on in that area, like the Freize Art Fair which is quite a big deal, because we’ve done some work in that world, we’re beginning to understand that just about everyone wants work for free or at least to pay very little for it. CB: Of all the projects you’ve worked on, do any stand out as being particularly memorable or enjoyable to work on? SM: It changes all the time. Sometimes you’re really happy with something and other days you look at the same piece of work and see the faults in it. There’s a couple of things that I really like because of their simplicity, they tend to be some of the older stuff. We did a window for Selfridges that I think is very us. There was no brief essentially, the concept was a window display based on window displays. We photographed different things around London, bits form McDonalds, dry cleaners, just anything really that caught our interest. We then recreated it, mostly in vinyl and we used suckers and things you would find in windows. The project came about through Creative Review magazine, we were chosen as one of the design firms featured in their ‘Creative Futures’ annual feature. That year as part of it you got given a window to design. Another project that stands out is one we did again for Tom Morton. It was an invitation to a one day art show, it was a quick idea, we cut up copies of Vogue magazine and took the pages that were purely advertising on both sides and used that as our base and just laser printed information on top of them. It’s probably the lowest budget job we’ve ever produced, it cost about 30 quid to do, and it’s one of our favourites. Things like an identity we did for a one year temporary gallery, a set of business cards on a tear off pad, there’s just something about the feel of it we quite like. We were probably a bit more free with our design when we first started out, now we’ve got overheads to worry about! CB: With those concerns, how do you keep yourself motivated and inspired? SM: Depression?! It’s hard to pinpoint anything exactly, mainly just by observing the things around you. CB: Do you draw any inspiration from any of the artists you work with? SM: I don’t feel like the work that we do is directly influenced by any of the artists we have worked with. I think it’s more from things like our collection of old books, lots of typographic oddities and such. We find inspiration everywhere, not particularly in one place, we might find it by looking at someones photographic work or what not. Sometimes it’s a good idea to look backwards! CB: You’ve mentioned that you’re looking to broaden your work outside of the arts, what sort of work would you like to do? SM: More art direction. We feel there’s a bit more scope to do interesting things working with other people to create imagery, it’s the sort of work we enjoy doing. At the moment we feel as though we’ve been getting work that just needs to be ‘put together’. CB: Would you have an ideal client you would like to work for? SM: Comme des Garçons would be pretty ideal for us. Someone who does very interesting stuff that doesn’t just follow the conventional route. CB: There’s a lot more opportunities to do that sort of work in London and Europe as a whole I guess? SM: There’s a hell of a lot of designers here as well though and each year design companies sub-divide and designers split off and start their own firms, plus a plethora of students leaving university who are really good, there’s a lot of competition. CB: What do you know about Australian Graphic Design? SM: I’ve seen bits. I’m not good with names, so I couldn’t name anyone in particular, but I’ve seen a few magazines that have come out of Sydney that have been quite interesting. There seems to be stuff going on in Australia now whereas you would never see anything, but now you do see quite a bit in magazines or whatever, mags like Grafik or Creative Review, you see Australian designers have submitted work. I think there’s some nice work coming out but I couldn’t tell you who did it though! Thanks to both Sean and Hazel for sparing the time to talk to me and show me their studios and work. All the pieces discussed in the interview can be seen on the Value & Service. website, a nice piece of work in itself, along with the rest of their portfolio. In case you’ve been thinking I’ve given up on looking at the local design scence, what with me swanning around world, think again as I delve into the creative cauldron of Adelaide to pick out another fine design studio to bring to your attention. Detour. are a design firm I’ve been meaning to present here for a while, I thought they actually didn’t have a website, in fact they’ve probably had one for a while, while I was looking for the company name followed by a .com.au, they were there all along hiding under a .net.au! Detour have been in business for what must be going on for 14 or so years now, which is a lifetime in the competitive design market of Adelaide. The studio is run by Catherine Bell and Abra Remphrey, Abra is of course, married to Parrallax head honcho Matt Remphrey – with that sort of design influence, their daughter is going to turn out to be the next Sagmeister or perhaps she’ll be overwhelmed by all that designy-ness in her life and opt for a career in something more lucrative like real estate or blogging. Anyways, the Detour site has an interesting and easy to navigate interface made up of a grid of coloured boxes that you click on to reveal the studios work. Some nice work there is too, highlights being some great labels for Hazyblur and Oldfellows wineries, The Banksia Pallative Care Annual report and a really beautiful and appropriate package design for Lanapelle wool rugs for infants. Detour are a part of the pack of Adelaide design firms that stormed into the Australian Graphic Design Awards this year to pick some well deserved gongs, so spend some time and take a look. One of the special displays that had on was a show on Formula One Grand Prix, not really my area of interest I’ve got to say, though they did have a car on display that I had as part of my Scalectrix model set when I was younger. At this point I was probably more interested in how that had set up their exhibits, graphics wise, rather than studying the intricacies of an exploded view of a McLaren F1 engine. 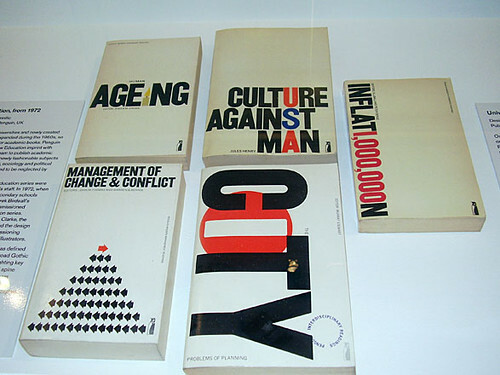 The main display area was dedicated to a sort of history of UK graphic design (though a pretty condensed version admittedly). I’m not sure whether this is on permanent display or not (is there anything on permanent display here? 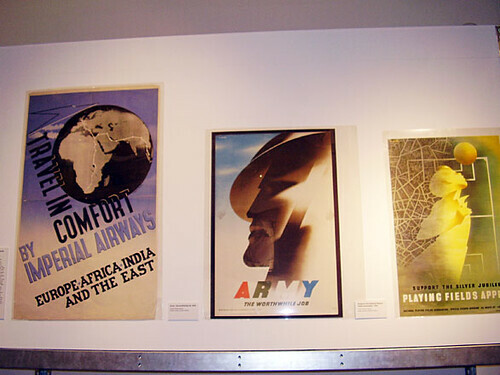 There were some beautiful WW2 deco inspired propaganda posters. This sort of illustration seems to be a lost sort of style these days, more is the pity. 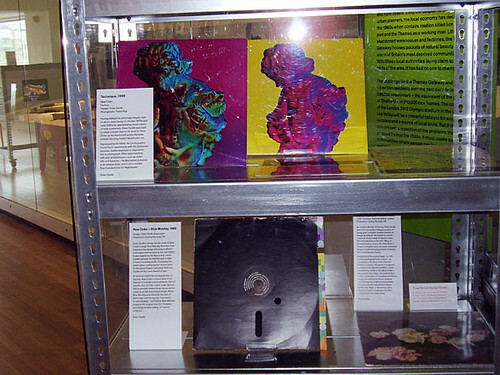 Best of all, there was a (small) display dedicated to Peter Saville’s Factory Records work, including the original ‘floppy disk’ inspired sleeve for the ‘Blue Monday’ single which I’ve seen in books plenty of times but never in the flesh as it were. 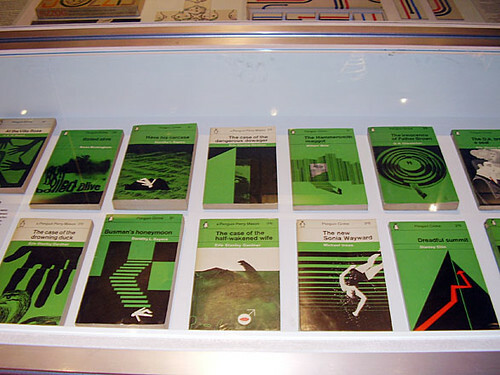 There was also a nice display of old penguin book covers, Penguin seems to be quite the flavour of the month as far the design blogospehere, maybe it’s due to the book that was release on Peguin book design a little while back, it’s good stuff, One Plus One Equals Three has a link to a Flickr photoset if I have at all piqued your interest. The museum was filled with bored looking school students plodding through displays, filling out obligatory class set assignments, occasionally a teacher would tell one of them that they had spent enough time on the ‘playstation’ display and they would plod off bleary eyed into another nook of the gallery. That’s about it as far as what is in the museum, ok I guess but hardly worth the Â£7 entry fee, pity I wasn’t there a month or so later to check out the Alan Fletcher exhibition. Being in the vicinity, and a little disappointed with the Design Museum, I figured I’d take the half hour stroll down to the Tate Modern. Caroline had expressed a slight interest, but was fearing that she would be forced to view, as she put it ‘blank canvases with a pile of pebbles underneath it’ which to me sounds like the most fantastic idea for ‘fine art’ I’ve heard in a long time which I intend toimplementt and enter in the Turners as soon as possible. Anyway, it was a nice day for a stroll (for a change) and the view along the Thames on the way can’ be beat. The walk took me past Shakespeare’s Globe Theatre, a replica that is built kind of pretty close to where the original was built. Did you know that Shakespeare’s first Theatre was called the Curtain and was built on the other side of the Thames. When the landlord wanted the land back, he took it apart and rebuilt it across the way.